Water meter data logger is designed for recording daily flow rate from pulse water meter by pulse signal and record pipe pressure value by analog signal. The water meter data logger is an useful tool for most of water meters,and part of flow meters, and pipe pressure sensors which have no data storing function, or water meters and flow meters just have low storing function to store flow rate of daily/monthly/yearly. Our water meter data logger is powered by built-n battery and can work well without external power, meanwhile, its IP68 water-protection class can ensure it can be used in harsh environment,e.g. installing well,etc. Not each one water meter or flow mete can always work well all the time and once they are fault, correspondent flow rate won’t be measured and thus, it may need manual compensation function to make lost flow rate into proper value. Thus, some nations and areas have ruled that water meters,flow meters,heat meters should have the ability to store data. But most of products can’t only store data of daily/monthly/yearly. This storing can’t provide accurate data for hours and minutes. 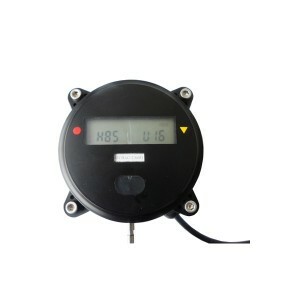 Thus, our water meter data logger can provide the function. 1) By RS485 port. Data logger has been equipped with standard RS485 port. With RS485-RS232 converter or RS485-USB converter, the data logger can be communicated with PC. We recommend RS232-RS485 converter. The stored data can be exported and manged by our data managment system. 2) By IR operator. With IR port, the stored data can firstly be stored in operator, and then downloaded to PC and managed by data management system. ● 1 built-in pressure sensor;default Max pressure is 0.6MPa. For bigger pressure, please indicate it while inquire or order. ● Data logging interval time: 1minute to 2hours. Can record 3 month data while interval time is 1 minute. This should be enough for water flow rate. ● Stored data can be exported to infrared operator or to PC by data management system software. ● System setting: Can set system time, station No., password, time interval, etc by PC or IR operator. ● Wholly water-proof enclosure for outdoor dew and water-immersed. IP68 class. ● 1 3.3V voltage output (Max:1mA),supply power for transducers, etc.